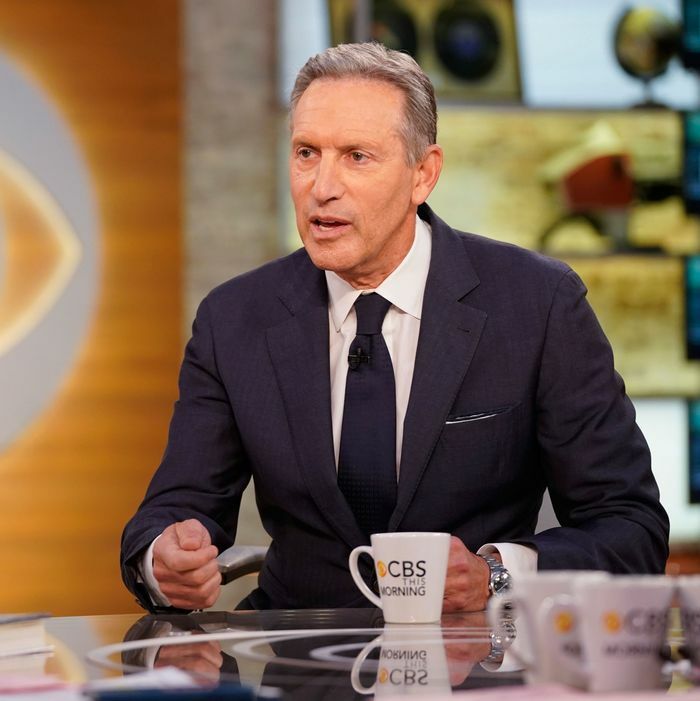 Howard Schultz’s presidential campaign opened up to mixed reviews — within the prized demographic of socially liberal, fiscally moderate billionaire moguls. (Michael Bloomberg expressed disapproval, while Schultz himself expresses strong enthusiasm.) Every other demographic category has registered a catastrophically negative response. Change Research found Schultz’s favorable rating among the public is 4 percent, with 40 percent viewing him unfavorably, and the rest not knowing who this person is. The poll even tested prompting respondents with favorable descriptions of Schultz — “Howard Schultz is a true American success story … He believes that the system is broken and there are extremists on both sides, and only an independent centrist can solve the problems that Republicans and Democrats refuse to fix.” — which nonetheless failed to coax more than 9 percent of the public to express support for Schultz’s campaign against any opponent. The polling still found that Schultz’s dismal percentage of support was nonetheless enough to swing the election to Donald Trump against most possible Democratic opponents. So it is simultaneously true that almost nobody likes Schultz and that he could pull enough votes to reelect Trump. Perhaps in an effort to push back against this data, Schultz’s team released very partial internal polling data. Somewhat suspiciously, the data did not show what information the respondents were given about Schultz, to possibly prompt them to support him. The bottom-line figures showed Schultz drawing a whopping 17 percent of the national vote in a three-way race with Trump and either Kamala Harris or Elizabeth Warren. The same figures showed Trump beating both Democrats 33 to 32 percent. In other words, Schultz’s own polling indicates he would lose badly, and would throw the race to Trump. The independent polling is even worse than that. Partisan Republicans have supplied one of the few sources of support for Schultz’s candidacy. The Wall Street Journal has an editorial praising Schultz and attacking his Democratic critics for being afraid of his as-yet hypothetical ideas. “They seem to fear a policy debate,” sneers the editorial, which at no point contemplates even the possibility that Democrats actually fear Schultz’s spoiler potential. Schultz approvingly tweeted out the editorial. Fox News reports that Schultz “told advisors that he was shocked by the stridency of the attacks made by Democrats,” a fact that, if true, would indicate an ignorance of the political system so proud it would be disqualifying. In case he hasn’t been following this closely, lots of people really want to defeat Trump and really do not want to open up a window for a historically unpopular president with a strong base but very low ceiling of approval to squeak through a split electorate with a minority of the vote. Apparently Schultz expected his announcement to go over like the rollout of a new seasonal coffee flavor. Turns out people really dislike this Trump guy and don’t want some wealthy political tourist wandering into a political war they’ve been devoting every waking hour to winning! Who knew?